The project Ecologist Herstel Lac en Zuidelijk Kustgebied is a project that will be executed by DRO and STINAPA. DRO will be responsible for the infrastructural works and STINAPA for the eco-restoration of the bay area. 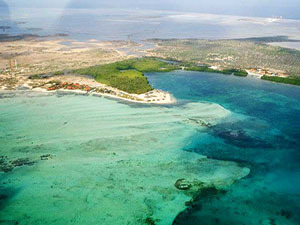 At the east coast of Bonaire is Lac Bay, a non estuarine lagoon surrounded by mangroves. Shallow, with a fringing reef, extensive seagrass beds and a maze of tidal creeks in the mangroves, Lac Bay is a perfect nursery for many reef fish, a juvenile habitat for conch (locally called “karko”), and a feeding ground for the green turtle. Clear blue waters and a prevailing eastern wind make it a popular area for recreation. It is actually the site where Bonairean youngsters started windsurfing to eventually become world champions. Lac Bay is part of Bonaire’s National Marine Park. It is also one of its five Ramsar wetland sites and an important and bird area (IBA). The land side of the bay has a mangrove wood. This mangrove area is the largest in the formerly Dutch Antilles. The dominant mangrove species is the red mangrove. Its prop roots form a substratum for many different species: bivalves, tunicates, sponges, hydroids and many more. These roots – full of live – are often very colorful and many tourists enjoy snorkeling through the channels in the mangroves to explore them. The area between the roots shelters many juvenile species of reef fish, some of them endangered like the rainbow parrotfish, Scarus guacamaia. More to the land side, we find the black mangrove, Avicennia germinans, with is roots sticking out of the mud and the white mangrove, Laguncularia racemosa. A little bit more on dry soil is the buttonwood, Conocarpus erectus, that with the wind can form the most interesting forms. The ability of the mangroves to florish in a salty, often inundated environment has been studied extensively. But there is a limit to these abilities. The black mangrove needs an environment that falls partially dry on a regular basis. Extended periods of high salinity are harmfull and stunt the growth, and the trees will eventually die. Large amounts of sediments from the catchment area north of Lac Bay have made the outer area of Lac Bay extremely shallow. The surface to volume ratio is high and evaporation too. The tendency of the red mangrove is to occupy all open shallow spaces and thus effectively block fresh seawater reaching the back area. As Bonaire has a dry climate, the fresh water influx in that area is negligible and salinities three times seawater have been measured. Erosion is a big problem on Bonaire due to lack of vegetation and overgrazing by free roaming goats and donkeys. Addressing this is very important, but not within the scope of this project. What can be done though is preventing more sediments entering the area and improving the water circulation. A sediment trap will be built in the area where most surface water runoff occurs. This is a one time construction which has to be maintained: ‘trapped sediments’ need to be removed on a regular basis. The current tidal creeks in the mangroves need to be widened to avoid the encroachment of new plants in open areas where they obstruct a free waterflow.